We recently experienced the end of daylight savings time. This means we set our clocks back one hour. So if you forgot, that means you showed up early to church that Sunday. This happened once for me and as a side note was probably a good thing because it happened as I was going through my divorce. I came to church early, was able to talk with someone I barely knew about my situation and also got to quietly sit and reflect in the sanctuary. The daylight savings debate is always an interesting one. I am in favor of continuing it without going back. This would eliminate the need to change the time twice a year and also I like more daylight at the end of the day. Turning the clock reminds me about a time when we took a step back in our own family. My wife Heather and I married after having gone through our own divorces. I brought a daughter into the marriage from my previous marriage while Heather did not have children –but boy did she bring animals. She had 2 cats and 1 dog, although one of the cats passed just before we got married. My daughter was about 8 when we got married. While she was generally a good student, we had spells where her grades were not up to par. My daughter was mostly a rule follower like I was growing up. However, if she and I felt an adult was not watching or paying attention she and I both could stray from what was expected especially when it comes to school work. When online grading systems were developed, we thought this problem was solved. Not so. There were flaws with this system. Teachers would input all the assignments in the beginning of the year, but if they did not input a grade it would show as a 0. We had many discussions (admittedly angered discussions) about why she was getting Zeroes not knowing this sometimes was not her fault. Now to be fair to us their were definitely times that my daughter was to blame as well. Caused an immense amount of stress and anxiety as we would check everyday waiting for things to update. The cycle would continue only get worse and feelings would get worse until communication seemed to break down in the family. Everyone felt like they were caught in the middle. We had to do something different. My wife and I are marriage mentors where we volunteer our time and remember learning that sometimes things need to be written down. Out of this we decided to draft a contract. The contract would now become the bad guy and not any one of us. It also gave us as parents the freedom not to have the responsibility to check in. It released me from so much anxiety. It would serve as a motivating factor to avoid a negative consequence but to also reward an especially good consequence. Recommend listening to The Remarried Life podcast episode #12 – Four Parenting Styles to learn more about each other. First there were several discusses by Heather and I before the draft to simply talk about the idea. Then she and I began to draft it out. The goal was to develop a unity between the two of us before presenting this to our daughter. This process was so helpful, because it removed a great deal of the emotion that swirled around our differences in parenting styles. The reward for when the expectations were signicantly exceeded (if the expectations were simply met then nothing happened). Put it on the fridge as a daily reminder to all. But again no need to interact on the subject matter, other than every once in awhile to ask my daughter if she needed help with anything. The outcome: She met the expectations so we considered the contract experiment a success. We tried the contract experiment only after much exasperation for all of us. My recommendation is to not let things get to the point we did before trying it. Once the contract goes into place, learn to abide by your part. As a parent the tendancy might be to hover and become anxious. 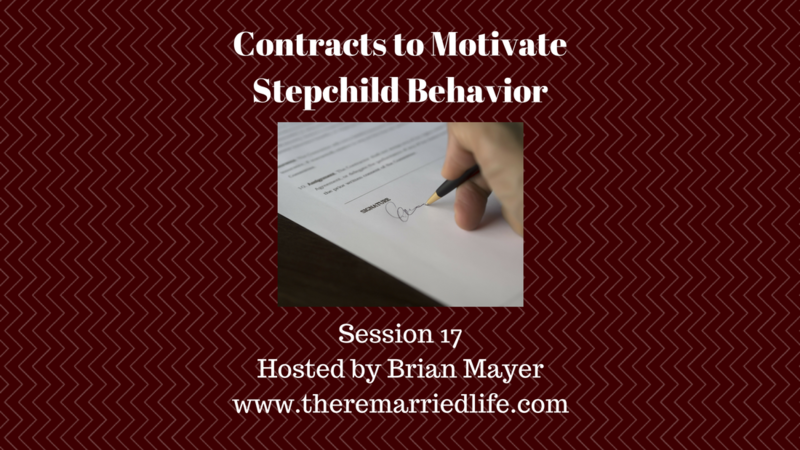 Let the contract do the work as the motivator. Celebrate when it works! If it does not work, continue to refine the process. Maybe the bar needs to be lowered slightly.